Molecular hydrogen is useful for various novel medical and therapeutic applications. In air, hydrogen gas is potentially explosive, whereas, in an aqueous solution, it is safe and convenient to use. Recent biomedical studies have shown that hydrogen is a physiological regulatory factor that has antioxidant, anti-inflammatory, and antiapoptotic protective effects on cells and organs [1–5]. As a result, several aqueous solutions of hydrogen have been developed for use in medical applications as well as in health drinks. 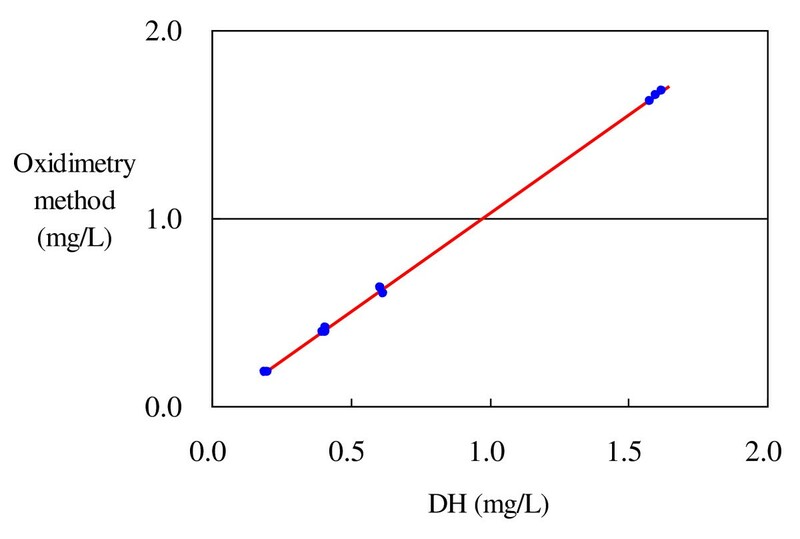 On the basis of the above equation, we used a volumetric analysis method called oxidimetry to determine the concentration of hydrogen in water by a titration by using the MB-Pt reagent (Figure 1). Conceptual illustration of the reaction between H 2 and MB-Pt. 1 mole of hydrogen molecules reacts with 1 mole of methylene blue (MB) molecules to give 1 mole of reduced MB (leucomethylene blue, leucoMB) molecules. MB (0.3 g) (Waldeck-Gmbh & Co KG, Munster, Germany) was dissolved in 98% ethanol (98.9 g) to give a solution of MB (99.2 g) in ethanol. An aqueous suspension of 2% colloidal Pt (0.8 g) (Tanaka Kikinzoku Group Company) was added to the solution and the mixture was stirred to give 100 g of MB-Pt reagent (MiZ Company, Kanagawa, Japan). The reagent was distributed in small plastic bottles, from each of which one drop of the reagent (17 mg or 0.02 mL) was drawn. Hydrogen-saturated water (0.8 mM) was prepared by bubbling hydrogen gas through purified water. Three concentrations of hydrogen-rich water (0.3, 0.2, and 0.1 mM) were prepared by diluting hydrogen-saturated water with purified water. Electrochemical determination of the hydrogen concentration was performed using an electrochemical gas sensor (model DHD1-1, DKK-TOA Corporation, Tokyo, Japan). Oxidimetry determination of the hydrogen concentration was performed by a redox titration. 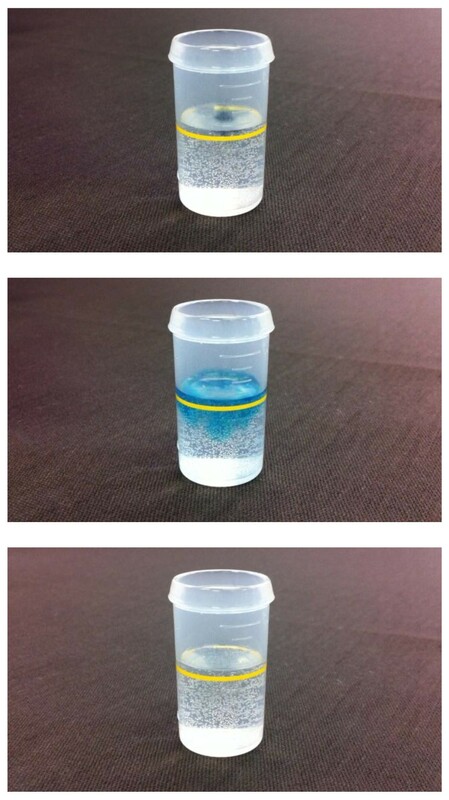 The MB-Pt reagent was added dropwise to 20-mL samples of hydrogen-rich water until the solution changed from blue to colorless (Figure 2). 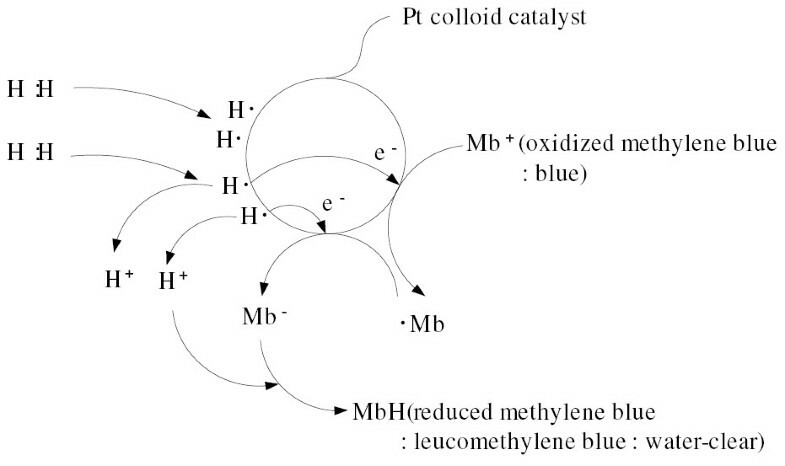 H 2 reduces MB (blue) to leucoMB (colorless). Early during the titration (MB-Pt reagent dropped into hydrogen-rich water), the solution contains more hydrogen than MB. Hence, MB is reduced to leucoMB and the solution is colorless. At the titration endpoint, the solution contains more MB than hydrogen; hence, it turns blue. 1. Drop an MB-Pt into hydrogen-rich water. 2. Hydrogen-rich water is colored by the blue of MB-Pt. 3. Immediately, blue turns colorless by hydrogen. Similarly, if 20 ml of hydrogen water reduces three drops of the MB-Pt reagent, the concentration of DH is 43.6 μmol/L or 0.09 mg/L. Table 1 lists the DH concentrations determined by both the known electrochemical method and our oxidimetry method. The two methods yield approximately equivalent results. 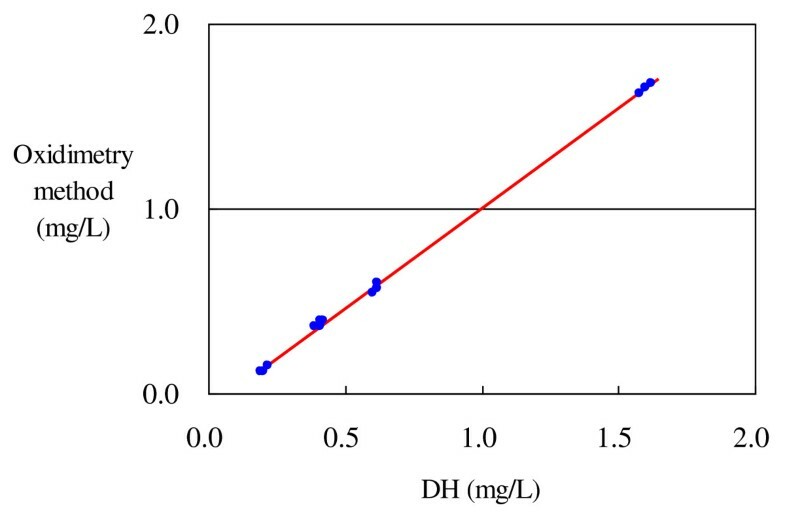 HW: hydrogen water, DH: dissolved hydrogen, MB-Pt: number of drops of methylene blue with colloidal platinum at the titration endpoint, MB→DH: calculated value of DH from MB-Pt, DO: dissolved oxygen, T: water temperature. DO was measured by a DO meter (model D-25 DO meter, Horiba). Although DO was degassed through the process of hydrogen bubbling for hydrogen-saturated water (0.8 mmol/L), DO in purified water used for dilution was mixed with hydrogen-saturated water, which caused an increase in DO in hydrogen water with dilution magnification. This seemed to cause a deviation in the DH values obtained using the oxidimetry method from those using electrochemical method at a lower concentration of DH. To study the influence of DO in hydrogen-rich water, we also measured DO-regulated hydrogen water prepared by diluting hydrogen-saturated water with DO-regulated purified water, where DO was degassed by bubbling inert N2 gas through purified water (Table 2). The values of hydrogen water for 0.8 mM are quoted from Table 1. The DH values obtained from the oxidimetry method approached those obtained using the electrochemical method. DO as an oxidant would compete with MB when molecular hydrogen reduces MB on the surface of Pt. Sixteen respective observed values obtained using the electrochemical and the oxidimetry methods were analyzed, premising that these values correspond to each another. A linear relationship between the values obtained using the oxidimetry method and those obtained using the electrochemical method was shown. This relationship was found using a regression model (linear regression model) having regression coefficients, in which the values obtained using the oxidimetry method were regarded as response variables and those obtained using the electrochemical method were regarded as explanatory variables. The amount of information that can be explained by the straight line was indicated by the coefficient of determination (R2). Moreover, a second-order component was added to the regression model to determine whether it deviates from linearity. In addition, the influence of DO and water temperature on the oxidimetry method was also determined. The linear regression equation for the electrochemical and the oxidimetry methods for DO-regulated hydrogen water is given below. Here, the correlation coefficient r was 0.9998, the coefficient of determination R2 was 0.9995, suggesting that the linear line indicated 99.95% of the information, and the deviation from the linear line or the standard deviation (error standard deviation) was 0.0129 (Table 3 and Figure 3). The linear regression equation for DO-unregulated hydrogen water is given below. Here, the correlation coefficient r was 0.9997, the coefficient of determination R2 was 0.9993, suggesting that the linear line indicated 99.93% of the information, and the deviation from the linear line or the standard deviation (error standard deviation) was 0.0158 (Table 4 and Figure 4). To examine linearity between the electrochemical and the oxidimetry methods, a second-order term b2 was added to the linear regression model as 'y = b0 + b1 × × + b2 × x2', and the significance level was determined (where b2 is regarded as significant if there is curvature with a second- or a higher-order term). As a result, the second-order components for DO-regulated hydrogen water (p = 0.8974) and DO-unregulated hydrogen water (p = 0.7429) were not statistically significant, and the relationship between the electrochemical and the oxidimetry methods was linear in both cases (Tables 5 and 6, respectively). The influence of DO and water temperature on the oxidimetry method was studied using a multiple regression model having values measured by the oxidimetry method as response variables and the values measured by the electrochemical method, values measured by the DO meter (mg/L), water temperature (degree Celsius), and the interaction between the electrochemical method and DO as explanatory variables. The result showed that water temperature is not statistically significant (Table 7). The influence of only DO on the oxidimetry method was then studied using a multiple regression model with the same response and explanatory variables mentioned above, except for water temperature. The relationship between the oxidimetry method, electrochemical method, DO, and the interaction between electrochemical method and DO is given below. As DO increases by 1.0, the value obtained by the oxidimetry method drops 0.0117, and the gradient for the oxidimetry and the electrochemical methods drops 0.0358 from +1.0575 (Table 8). 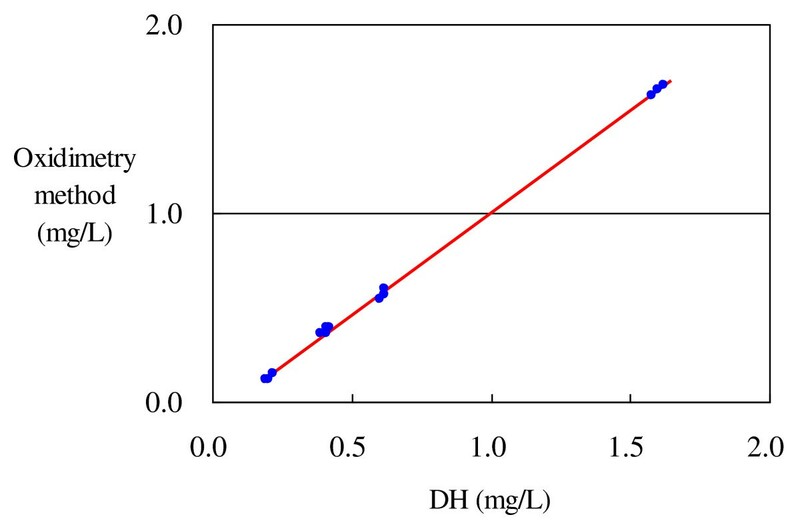 The linear relationship between the electrochemical and the oxidimetry methods for DO-regulated hydrogen water is obtained as shown below. Here, the intercept is almost 0 (-0.0229), and the gradient of the line is 1.0459 or approximately 1. These findings indicate that the oxidimetry method reflects the numerical values obtained using the electrochemical method correctly, i.e., the accuracy is sufficient. The correlation coefficient r is 0.9998, the coefficient of determination R2 is 0.9995, suggesting that the linear line indicates 99.95% of the information, and the deviation from the linear line or the standard deviation is 0.0129, which is almost equal to the minimum displaying unit of 0.01. The results show that the oxidimetry method has sufficient precision (accuracy) and can be used as a substitute for the electrochemical method. The linear regression equation for DO-unregulated hydrogen water is given below. Multiple regression analysis reveals that as DO increases by 1.0, the value based on the oxidimetry method drops 0.0117, and the gradient of the oxidimetry method and the electrochemical method drops 0.0358. The measured hydrogen concentration of the solution was approximately between 0.2 and 1.6 mg/L at this time. The oxidimetry method was practically sufficient to measure the hydrogen concentration to one decimal place within this range. The oxidimetry method is inferred to be useful for a substitute for the electrochemical method. We thank Mr. Toshihito Furukawa at the Biostatistical Research Corporation for statistical analysis. This study protocol was funded by MiZ Company. Tomoki Seo, Ryosuke Kurokawa and Bunpei Sato are all employees of MiZ Company. The authors equally contributed to the production of this article and have read and approved the final manuscript.